Essential Skills Advantage offers supplemental learning for grades K through 6 in the Complete Home Learning Suite. This new online program is geared specifically to Home Schools. There are no rigorous expectations as the program is all self paced. Reading at the first grade level includes, site words, basic grammar and reading. In Language and Grammar you have the choice of programs to use at this grade level. You can work on phonics or spelling. The higher grades offer different program choices, based on what the student would be learning in that grade typically. Our primary focus with this program was the Reading, and Language and Grammar. The site words have been really important. The repetitive nature has really helped my son learn the words and be able to recognize them. There are 52 different exercises with 5 different word lists. That is approximately 10 different activities for each list. 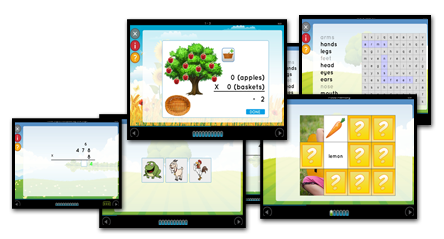 Some of the screens are; Auditory, typing, flash cards, picture match, comprehension, and see and spell. Having such an array of activities, using the same words, really cements them into mind. The words do tend to get harder, so I recommend you start with list 1 and work your way up. ESA will take you to where you left off if you click on the correct icon. For the Reading portion, the student is given a short story to read. Blue highlighted words you can click on and they will read it to you. I appreciate that they automatically read the questions to the student as well, not assuming that they already know how to read. For my 8 year old, reading is a struggle and we need to help him as much as possible. The ESA reading was not overwhelming to him like some programs are. He would read the story, and answer questions. After that there was an activity to choose the correct word that went in the story. So not only are they reading the words, they are working on learning what the word looks like. After the three stories in the unit, there are fun activities that combine the words from the stories. Working its way to a more difficult level. The hard part for me is not knowing how much work Maverick should do on each given day. Because it is self paced, there isn't any recommendations on how much to go through. There are 14,000 activities available, so I certainly don't think he can do too many! The program is mobile friendly, and Maverick was able to do it on his tablet. This is a huge plus for me, as each of the kids have a devise to work with online curriculum, rather than a PC. It is very important for me that they can access it anytime, on their own. I thought it was funny in the Learning Time section where it asked home long it takes to clean your room. One year, 10 hours or 30 minutes. Well.. that really is tough. Maverick chose a year, then 10 hours. Both truly could be more realistic than 30 minutes. Gave me a good chuckle in the midst of math. Geography is unfortunately something we don't get to as much as I would like. This program starts at grade 4 so it is something we may wait awhile to do. Science is for the younger grades however from K through 3. We get quite a bit of science, living on a farm, but it is fun to have an online program to work with as well. The choices are; Physical, Earth & Space, and Life Science. Check out what some Crew Mates had to say about their experience with ESA, and a variety of grade levels. Click on the banner below.